American Animals is an original, entertaining and thought-provoking take on the heist genre that blends drama with doco. American Animals tells the “true” story of a bungled heist carried out by four college students in Lexington, Kentucky in 2004. The most intriguing aspect of the film is not the heist itself, but that interviews of the actual culprits are interspersed with the dramatized narrative. 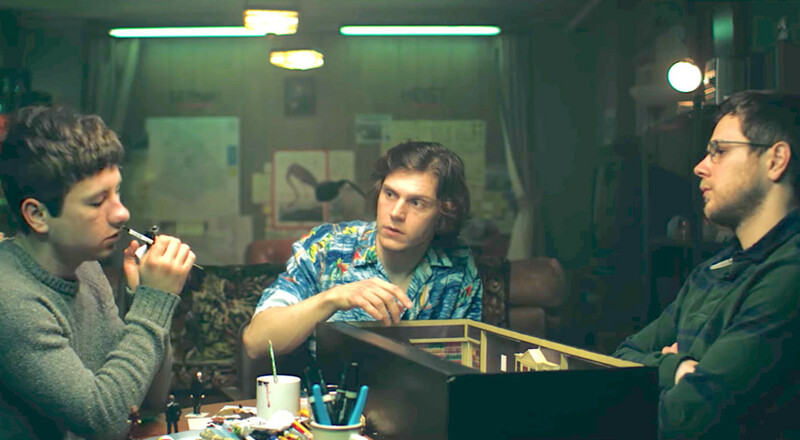 The most charismatic of these are the masterminds behind the heist, Warren Lipka and Spencer Reinhard, (whose characters in the drama are played by Evan Peters and Barry Keoghan respectively). Partly via the interviews, partly through the dramatization, we learn of their plan to steal rare books worth millions from the special collections section of Reinhard’s university. Turns out they were motivated not so much by greed as the adrenaline rush of “stepping over the line”. And a kind of misplaced romanticism in Reinhard, who sensed that he needed more adventure in his life in order to pursue his artistic aspirations. The interviews with Lipka, Reinhard and co (and their aggrieved and, it seems, still bemused parents) inform us in advance that the heist fails, resulting in lengthy jail terms for all involved. However, that does not detract from the narrative tension; rather, it enhances it. Knowing the heist really happened and having seen the actual participants talking about it adds a sense of heart-pounding authenticity to the dramatization of its execution and the aftermath. Discrepancies in the interviewees’ accounts of what happened and why add to the intrigue. Questions over their reliability are left hanging. Did Lipka fly to Amsterdam to arrange a “fence” to sell the booty? How sorry are he and his accomplices that they tasered and traumatised middle-aged librarian Betty Jean Gooch (Ann Dowd) when carrying out the heist? Going by the undiminished twinkle in the real Lipka’s eye, you wonder whether he, at least, is sorry for anything, despite his years in jail. American Animals is an original, entertaining and thought-provoking take on the heist genre. In blending drama with doco, it cautions against equating perception with fact. That’s a point worth making in these dumb days of binary politics and morally righteous social media tribalism.